..........not when the City of Melbourne self-guided walks booklets can be found for free. 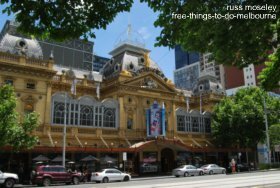 They've put together eight really good self-guided walks showcasing Melbourne's fabulous sights (see details below). Walks numbers 1 to 7 start and finish at Federation Square - what could be easier?! .........Victoria Miller from the USA kindly let me know about these downloadable brochures - please let me know if YOU find anything I haven't mentioned in this website that you think will be useful to others. ...... They have maps, routes and information about the attractions you'll pass on the walk. ....... I'll be making a list shortly of the places they recommend that I haven't come across yet - no doubt there'll be some hidden gems among them still waiting to be found. A 2 hour 3.75 kilometre walk through lush parklands, delightful lanes and looking in magnificent cathedrals. A 2.5 hour 6 kilometre walk passing sculptures, monuments and walking through the beautiful Royal Botanic Gardens as well as Queen Victoria Gardens and Kings Domain. 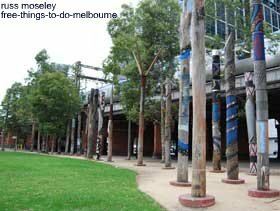 A 2 hour 4.75 kilometre walk on the Yarra River waterfront passing spectacular bridges, Indigenous history, sculptures and promenades. A 1.5 hour 2.5 kilometre walk concentrating on lanes, alleyways, little streets, arcades, cafe society and fascinating shops. A 2 hour 3.75 kilometre walk passing magnificent buildings, city laneways, Chinatown, the 'Paris' end of Collins Street, statues, arcades and more. A 2 hour 4.75 kilometre walk along the banks of the Yarra River passing the location of the 1956 Olympics, through the fabulous Royal Botanic Gardens and back past the rowing boatsheds. 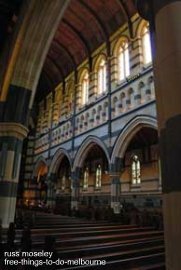 A 1.5 hour 3 kilometre walk through East Melbourne discovering elborate ironwork, classic columns and lofty verandas from the Victorian era. 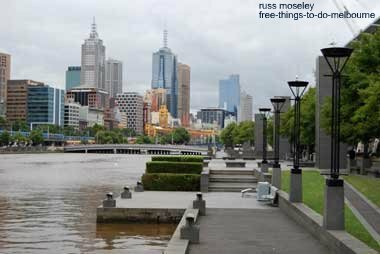 A 45 minute 2 kilometre walk mainly along the built-up area on the banks of the River Yarra in the centre of Melbourne, taking in a bit of the Docklands and finishing at Federation Square.